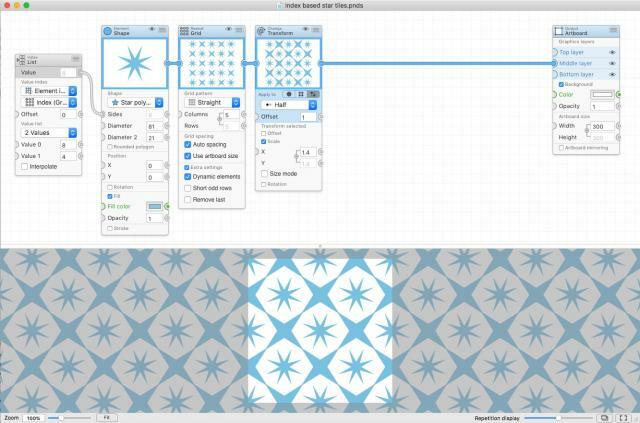 The second generation of the mac vector pattern design and animation application Patternodes has now been released. Click below for more information, or download and try it out for free now! Fewer more versitile nodes. Many node types have been combined into more capable ones. This will let you do more with fewer nodes and make it easier to try new things and play around with the software without having to replace or add new nodes. Improved usability. Many improvements to make the basic tasks of editing values and working with nodes and connections smoother and quicker. New artboard node with layers. 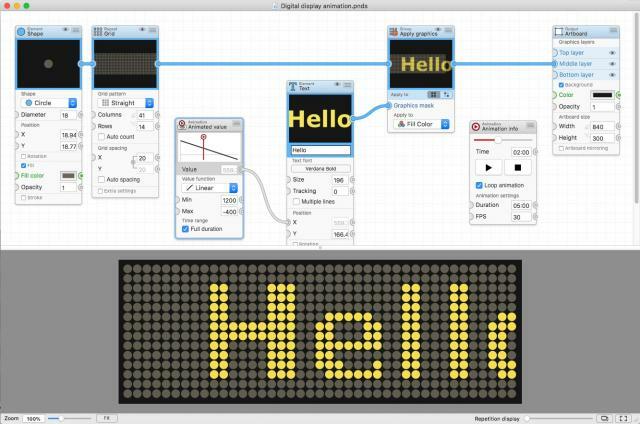 The old document and output nodes have been combined into a single Artboard output node with multiple output layers along with artboard size and settings. Language and naming changes. Many concepts have been renamed to be more in line with industry standards and/or common language to make them easier to understand. For example, the old Transform nodes are now called Change nodes and the old Array Elements are now simply called Groups. Change node apply-modes. Most of the nodes changing graphics (like changing color or transformation) now have built in support to toggle between applying their change to the group, each individual element in the group, or a selected subset of elements in the group. This replaces many array operation nodes and removes the need for a lot of splitting and combining you had to do in Patternodes 1. More powerful nodes. More or less every node, for creating shapes, transforming or repeating elements have had little additions and improvements to enable new uses and improve existing functionality. Improved animation exports. Support for exporting longer animations at higher resolutions in more formats. 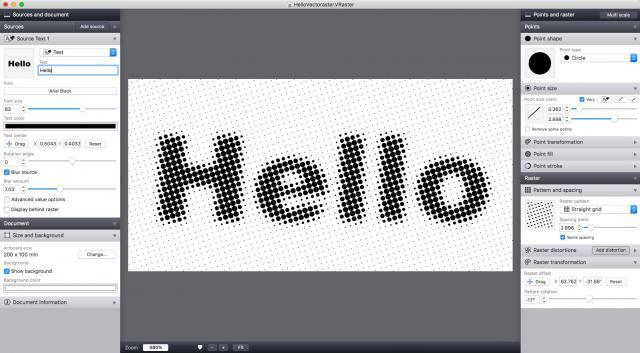 Today another small update to the vector graphics halftone and raster application Vectoraster 7 has been released. The new update doesn't add any big new features, but updates some things under the hood and adds some small improvements to importing of EPS and SVG custom point shapes. Update from within Vectoraster, or download and try the new version for free if you don't have it already. The 3d dice app Nice Dice for iPhone and iPad has been updated. The new version fixes a problem with iPhones with 3d-touch (6S and later) where it would be hard to lock dice by tapping them. Additionally it adds the option to speak the result of the dice when they've finished rolling. Another update to Vectoraster 7 has just been released with some more improvements and fixes. 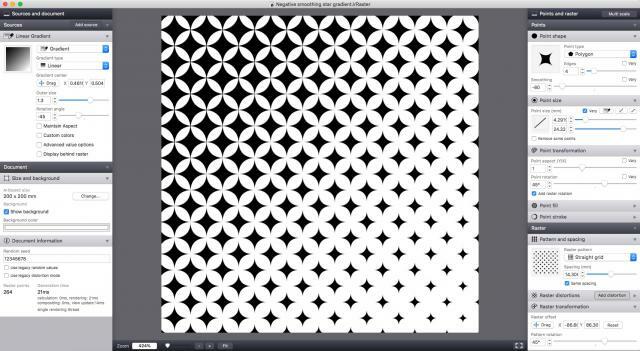 Fixes a bug where TIFF, JPEG and PNG file exports would be double resolution on systems with retina screens. 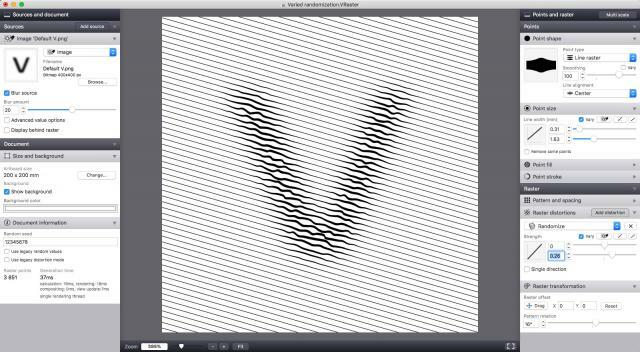 Improved compatibility with vector point shapes exported/copied from Sketch. 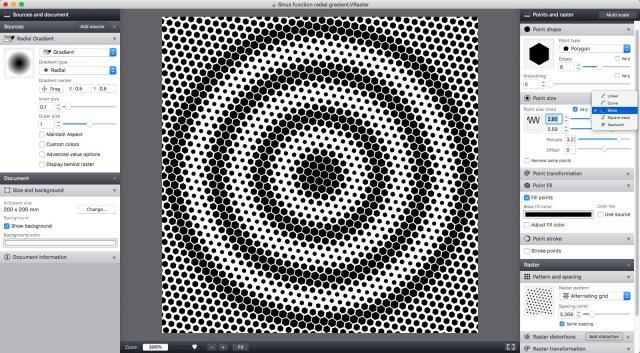 A new update to the vector halftone and patterns application Vectoraster 7 has just been released. The new update is mostly a maintenance and bug-fix update, but also includes a new quick full screen preview feature. New quick full screen preview, toggle with Command-F or using the new full screen button. 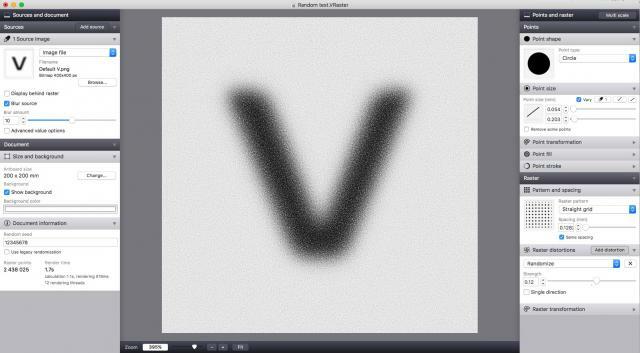 Sources visible behind the raster in Vectoraster are now also shown in the Finder file previews. Some bug fixes and system required updates under the hood. Improved support features with network diagnostics for update/unlocking problems. 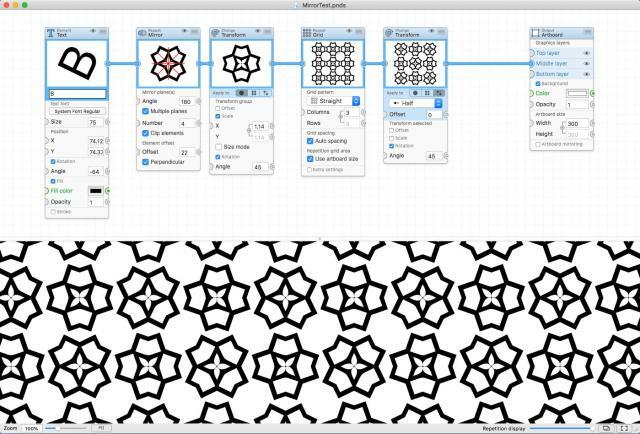 The second generation of the macOS procedural graphics design and pattern creation tool Patternodes is now in beta testing. The new version will be an overhaul of more or less everything in the application, with new features and improvements across the board. You can read more about Patternodes 2 by clicking below. And if you like what you read you can sign up to be notified when it's released. While the ambition was to keep supporting macOS 10.9 and later for Vectoraster 7 it seems we haven't been able to make some of the new features added in later updates fully compatible. We've therefore pushed the system requirements for Vectoraster 7 up to macOS 10.11 for the current version 7.2.0. For users with macOS 10.10 or 10.9 who are having problems with the software you can download an earlier version of Vectoraster 7 from the Legacy downloads page and moving forward only the last compatible version should be offered via the application updating feature. 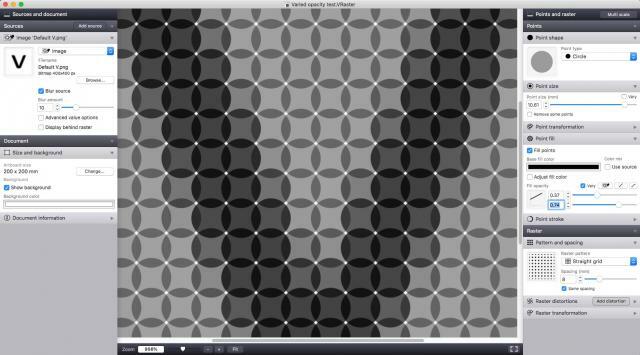 The vector graphics half-tone and raster tool Vectoraster has just been updated to 7.2.0. The new version adds new dynamic Text sources, letting you make text-based raster effects within Vectoraster and adds a bunch of interface usability and support improvements. If you're already a user you can just update from within the Vectoraster, if not you can download it and try it out for free using the link below. For Vectoraster 6 users there's a great upgrade offer. New Text source type, letting you generate type source images with your choice of text, font etc to base your raster on. New interface icons and improved help and support tools in the Help menu. VRaster files now get thumbnail icons for use in Finder when saved (can be turned off in the settings). New setting to change the interface background color. The iOS 3d dice rolling app Nice Dice has been updated and the new version is now available via the appstore. The new version fixes some graphical glitches for iOS 9 users that the previous updates introduced and adds new ways of customizing the app. You can now in a more consistent way turn on and off different interface components (like buttons, result displays etc) and configure what happens when you tap the board, when you tap dice, shake the device etc. So more of you can set up the app to work the way you want it. 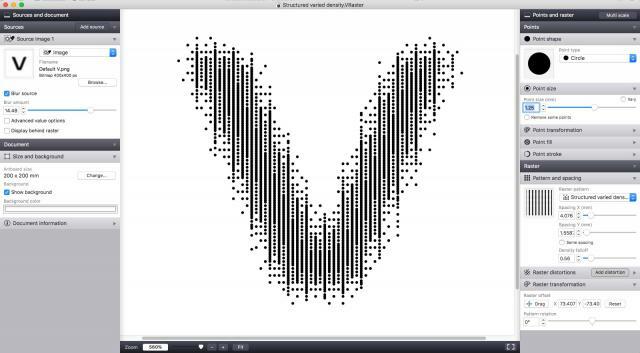 The vector graphics half-tone and raster tool Vectoraster has just been updated to v 7.1.7. If you're already a user you can just update from within the application, if not you can download it and try it out for free using the link below. If you're still using Vectoraster 6, this is a great time to upgrade for just $9.95. 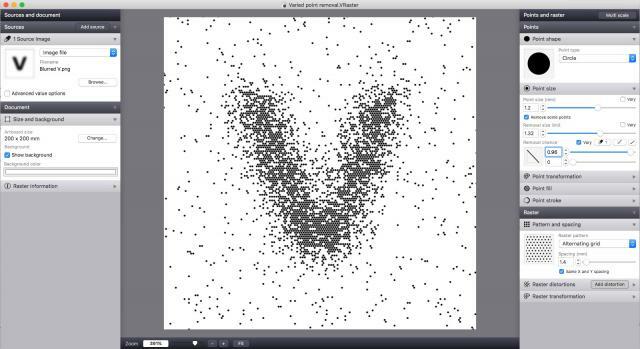 Improved randomization algorithm to avoid artifacts and patterning in randomized rasters with a large number of of points. There?s an option to use the old random generator below the random seed setting in the document information panel. 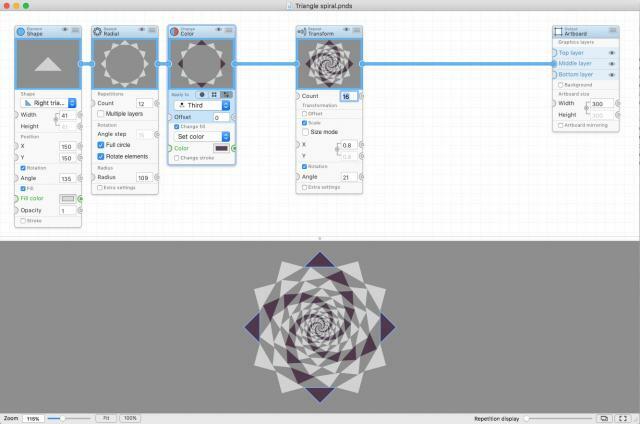 Changed to an SVG-based default custom shape file as EPS import has caused problems on some systems. Fixed a problem with compression artifacts appearing near edges when blurred sources where used for varied density raster patterns. The new version brings a couple of new features that lets you configure the interface and how you want to use the app. For example by introducing a new way of rolling dice by pressing a separate roll button instead of just tapping anywhere, and letting you hide more controls you many not be using in the rolling interface. The update also tweaks and improves some aspects of locking and moving dice, as well as the dice collisions sounds and handling device gravity with changing device orientation. The iOS and macOS password app Dotpass has been updated, and the new version is available on the appstore. The update fixes some small inconsistencies and keeps the app up to date under the hood. Dotpass is a security solution for generating and keeping track of unique good passwords for all your accounts, without anything stored or transferred that can be hacked or lost. A nice and comprehensive review of PatterNodes has been published over at CreatevePro.com. 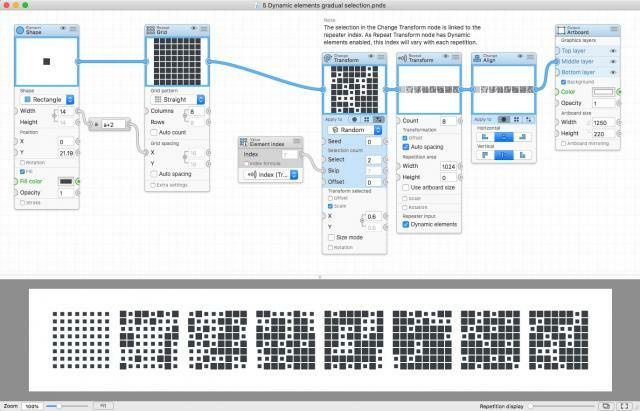 Could be especially interesting to hear the reasoning on trying the software as a new user, interested in creating graphical patterns but unfamiliar with the node-based procedural approach. Another small update patch was released today, fixing a bug where blurring non-square source images could result in a skewed output along with some other small improvements. Update or download today! This update was originally released yesterday as 7.1.5, unfortunately this build had some stability problmes and has today been fixed and re-released as 7.1.6. A new update to Vectoraster 7 has been released, and is now available to download for free or update from within the application. With this update we're also cutting the price of upgrading from a previous version of Vectoraster to just $9.95. So if you're still using an earlier version of Vectoraster, this is a great time to upgrade. You can now quickly use the mouse scroll wheel to edit values in value fields. 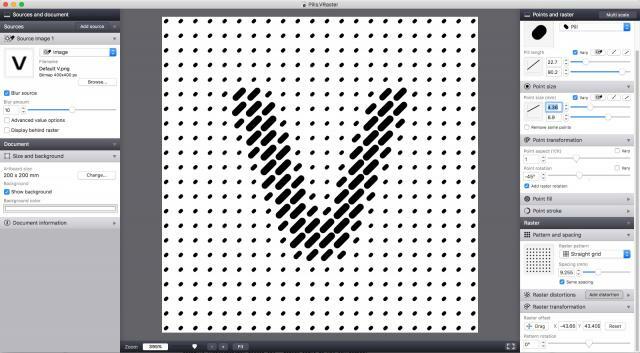 Fixes some problems with pasting in vector custom point shapes from Illustrator. Added new option to gradient sources to maintain the aspect of the rendered gradient when used in non-square raster artboards, instead of scaling it to fit. Fixes to make sure the source image size and document size dialogues show sizes in the correct length units. Seems like the physics simulation in the last version of the iOS dice rolling app Nice Dice was a little too realistic, in the sense that the dice could fly off the table if you shook your device too much. The new version hopefully fixes this, and also adds a new interface setting letting you lock the interface to portrait mode on the iPhone version (or not). 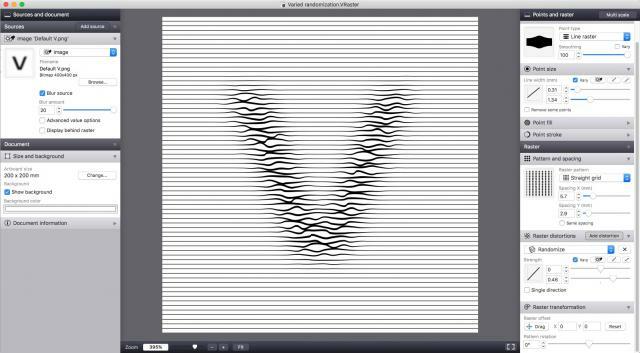 Today a new small update to Vectoraster has been released and is available for free download or update from within the app. The update fixes some stability issues, fixes some issues for first-time users and adds the new feedback dialogue recently added to PatterNodes. So now getting in touch with suggestions, praise, complaints or bugreports will hopefully be a smoother process. 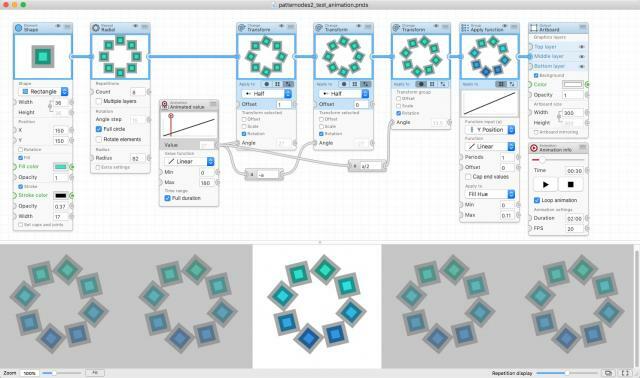 Today a new update patch to the parametric pattern creation software Patternodes has been released, you can download it for free or use the update feature in the application to update. Fixes a bug where exported animated GIFs would not loop properly in some browsers. 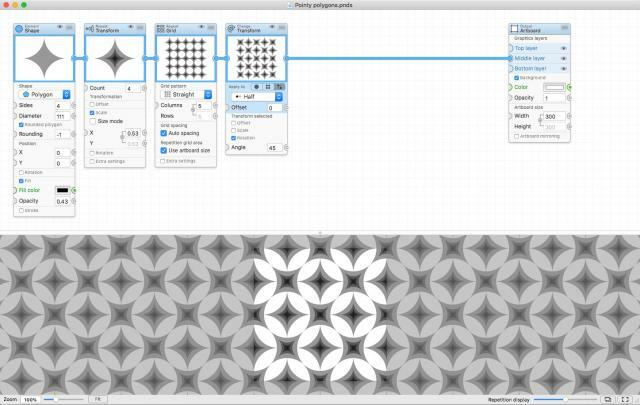 Fixes some problems with resizing of preview and note nodes. Improved feedback and bug-reporting dialogue for users not using the Apple Mail client. Added links to lostminds.com support and Patternodes 2 beta testing information to the Help menu. 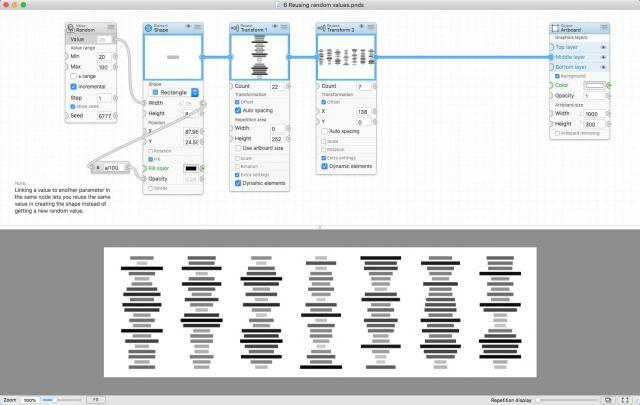 This will likely be the last update of Patternodes 1.x.x, as the next big update Patternodes 2 is now in development. If you want to help beta test the new version or find out more, you can do so at lostminds.com/patternodes/beta_testing.php. EDIT: This update was initially released as 1.8.3, but that build had some problems so it was rolled back fixed and re-released as 1.8.4. Another small update has been released for Vectoraster 7 with a couple of bugfixes and improvements. Just update from within the application or click below to download the latest version. 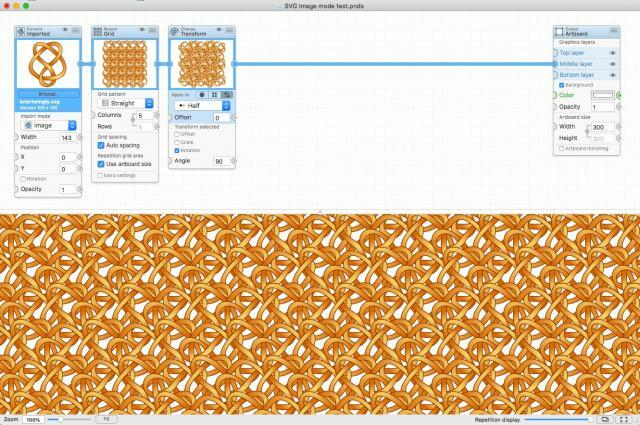 Improved handling of source images with transparency. Fixes a bug where using pdf or eps files as your source image could cause a crash. 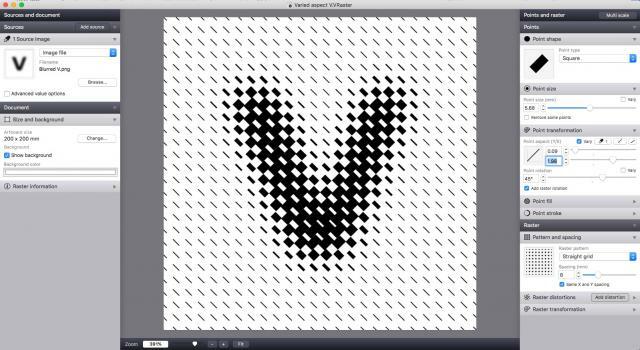 Some convenience improvements when dragging or pasting source images or custom point shapes into Vectoraster. A new user setting that when enabled removes the source image blur filter when a new source image is imported, to avoid confusion. The lostminds.com website has now been given a bit of an overhaul. Most of the work has been under the hood, but the front end has also been updated a little to work better on mobile and be quicker to navigate. Most things should still be in the same place, and old links should still work or be re-directed automatically. But there are sure to be a couple of little quirks and broken links left in that we'll fix in the coming days. So if you run into something like that, please be patient.